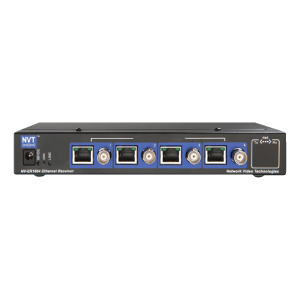 The NVT Phybridge Model NV-ER1804 TBus Ethernet over Coax/UTP Receiver is a compact bus-architected receiver hub that has four TBus ports, each capable of supporting multiple TBus transmitters and their subsequent 10/100BaseT Ethernet and PoE+ powered devices. The TBus transmission medium can be coax, 2-Wire/UTP, or Shielded twisted-Pair. Data rates up to 150 Mbps are achievable, making these devices the ideal choice in new or legacy installations where existing cable is re-deployed as part of an upgrade to IP cameras. 56 VDC is provided by a local power supply. These transmitters are extremely simple to use, with no IP or MAC addressing required. Status LEDs indicate power and link connectivity/quality/activity for RJ45 and TBus ports. The NV-ER1804 is backed by NVT Phybridge’s award winning customer support, limited lifetime warranty, and advance replacement. *Distance and number of devices supported may lower due to limited power supply capacity and wire voltage-drop, or data-rate limiting due to the selected wire’s high-frequency signal attenuation.